Thanksgiving is nigh, Seattle! This holiday ranks in my top 2 favorites (toss-up with Halloween) and let’s face it, we all know why – the feast! With Visit Seattle’s recent launch of Instagram (that just happened! ), we wanted to think of a great, seasonally appropriate way to get people involved with the account that would also highlight all of the amazing things about our city. 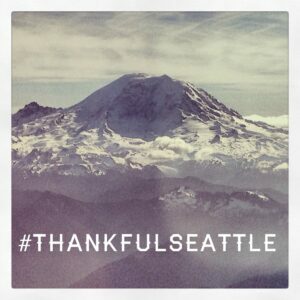 The plan – tell us what you’re thankful for, Seattle! I’m sure most of you who have been to this city can understand why a person who gets to spend a lifetime, a year, or even a few days here could consider themselves lucky. Breathtaking views, abundant natural beauty, amazing food at every turn, an inspiring arts, culture and music scene, quirky neighborhoods that instantly feel like home, an economic climate that encourages innovation and promotes corporate responsibility; all of these things are a part of Seattle and a reason why I am thankful to live here and welcome visitors here every day. Now, even if you’ve never been to Seattle, you can follow along with us on Instagram and hopefully get a sense of the city through the images. If you have been to Seattle and have some great photos to share, tag them with our hashtags #VisitSeattle or #2DaysInSeattle so we can check them out too. If you’re feeling extra thankful this week, join our contest and show us what you’re thankful for by tagging your photo with #ThankfulSeattle. As I write this, thinking about the upcoming holidays that I’ll be spending with family and friends, the cold, crisp weather outside, the Washington wine that will be my only contribution to Thanksgiving due to my utter lack of cooking skills… there is so much to be thankful for. Guess I better start snapping some photos.